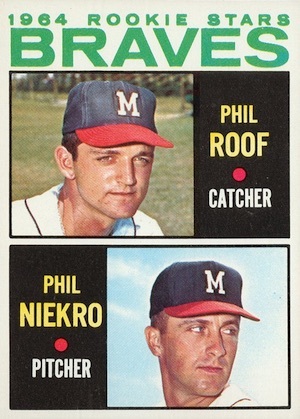 While it might not match the strong designs or checklist power of previous releases, 1964 Topps Baseball still features a solid selection of Hall of Fame names and the rookie card for Phil Niekro. 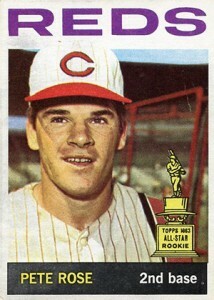 The second-year card for Pete Rose also maintains strong interest. 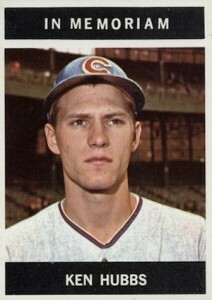 Shop for 1964 Topps Baseball cards on eBay. 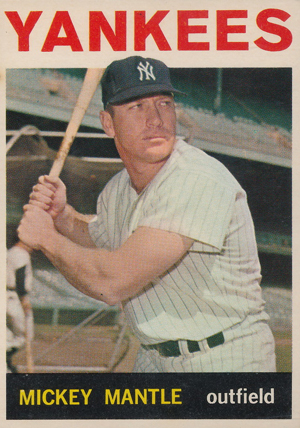 1964 Topps Baseball card fronts display a full-color posed photograph of the player in either an action position or portrait. The huge team name at the top dominates the design and makes the cards easy to spot. 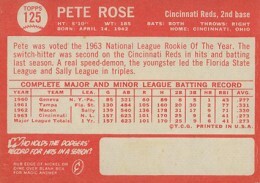 The bottom of the card contains a contrasting colored banner which houses the player's name and fielding position. 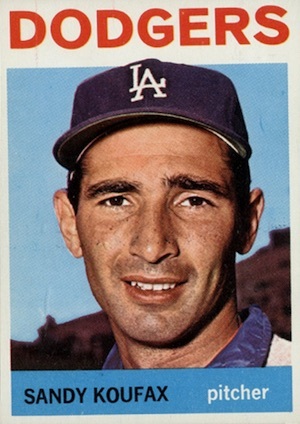 The '64 Topps design isn't a collector favorite as most agree that the team name simply takes up too much space on the card and often interferes with the depicted player's image. The card backs are a noticeable orange color and contain the standard biographical and statistical information. However, a new twist to the back of the cards was added in the form of a "magic" answer to a trivia question about the player. Collectors are instructed to "rub edge of nickel or dime over blank area for magic answer." 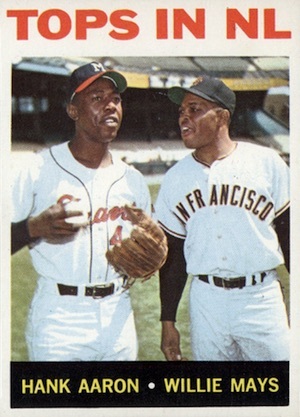 This, of course, led to considerable wear on many of the 1964 Topps Baseball cards. However, one exception to this is Mickey Mantle. 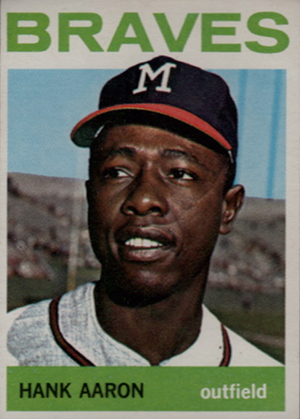 Mantle's stats run the entirety of the card, leaving no space for the trivia section. A familiar mix of subsets add more options among the 587-card checklist. Like the previous year, League Leaders (#1-12) start things off with the top statistical performers. World Series Highlights (#136-140) covers the short title series between the New York Yankees and Los Angeles Dodgers. Rookie Stars, All-Stars, multi-player cards, team cards and checklists also return. One notable addition to the base set is the "In Memoriam" card for Ken Hubbs (#550), who tragically died in a plane crash early in 1964. While Phil Niekro is really the only key rookie, Richie Allen, Tommy John, Tony LaRussa and Lou Piniella all have rookie cards in the set. 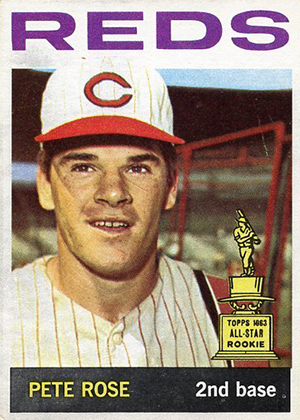 Given that 1963 Topps largely featured rookies on multi-player cards, '64 Topps offers the first individual player cards for Pete Rose and Willie Stargell. This helps boost the interest and value for these two players, especially for Rose. Relatively free of errors, there are minimal variations in the set. Most of the error cards went into packaging and were never corrected. The majority are merely typographical in nature. Cards #4 and 517 both have corrected versions that update minimal errors. Additionally, collectors could find Topps Coins inserts in packs of 1964 Topps Baseball. The oddball metal collectibles came one per wax pack or two per cello pack. There are 164 coins in the set, with the first 120 being the regular series and the final group containing the All-Star versions. Base NL coins are silver, while AL coins are gold. 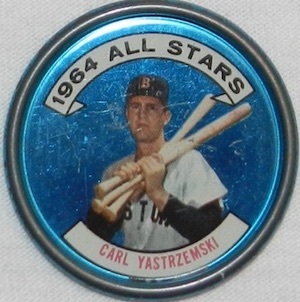 The All-Star coins are similar, with the AL coins found in blue and the NL in red. Three All-Star variations bring the total to 167 coins. 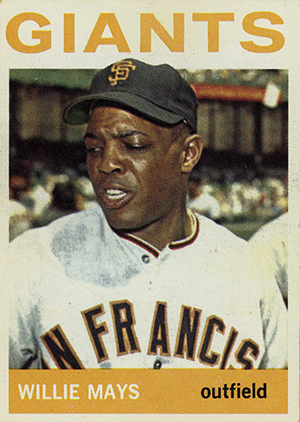 1964 Topps Baseball was issued in three different retail packaging options. 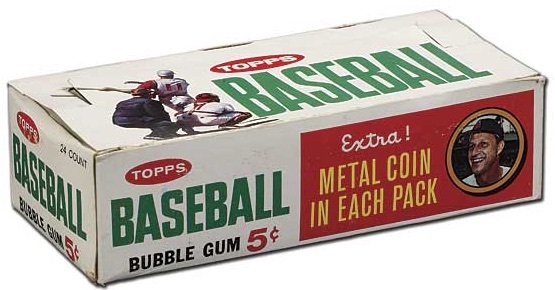 Collectors had their choice of purchasing either five-card wax packs for a nickel, ten-card cello packs for a dime, or one-cent Fun Packs which contained a single card from one of Topps' other releases during 1964. This includes Topps Giants, Standups, Bazooka, and Photo Tattoos. 587 cards. Shop for base sets on eBay. 167 coins. Variations are listed below. 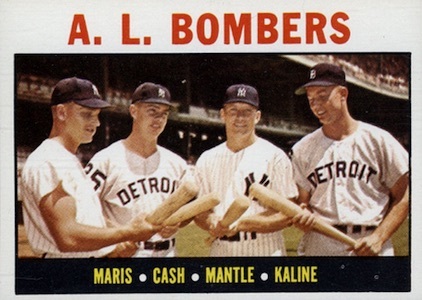 I have always liked the photography of the 1964 Topps set, plus the block lettering (team) at the top of each card. The 1964 set is a very challenging set to complete, but it is an easier set to complete than most of the other sets of the 1960’s. 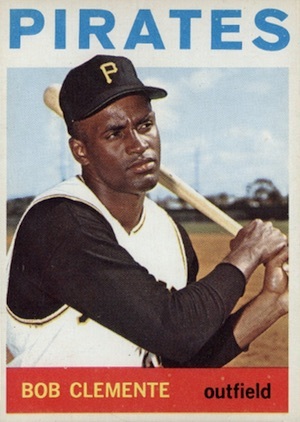 Fortunately, I completed the 1964 set in the late 1980’s, at a time when old baseball cards were a lot cheaper back then. 1964 TOPPS #55 ERNIE BANKS CUBS PSA 9++ NO 10'S!